Home of the original free carbon offset certificate. Don't be fooled by imitations. This is your source for free, customizable carbon offset certificates. They have always been free, and always will be free. Get as many as you want, for free! It can and it is! You may have seen other sites offering carbon offsets for $10, $20 or more a month. 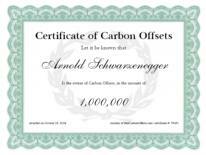 Well, with FreeCarbonOffsets.com, you can get carbon offsets absolutely free! How can I get my carbon offsets? Just click on the certificate link, fill out the form, click go, and within seconds you will have a beautiful personalized certificate downloaded right to your computer. This certificate is suitable for framing, and allows you to show others that you are doing your part to save the environment. What will be done to improve the environment for my carbon offsets? Click on the FAQ link to find out just exactly what we at FreeCarbonOffsets.com will be doing in exchange for your carbon offsets. It's not too late at all. You just do not yet know what you are capable of.